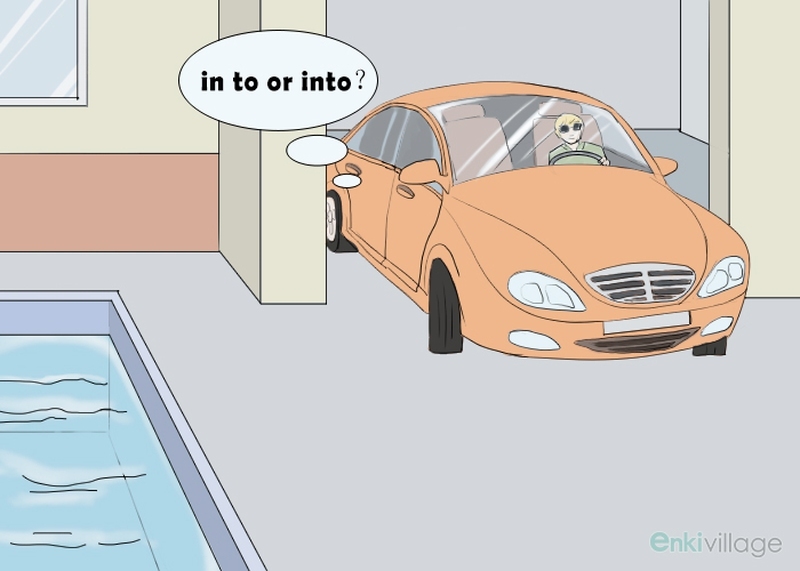 In To or Into: What's the Difference? In or Into: What's the Difference? A befuddlement of many writers is when to use “into,” which is one word, or “in to,” which is two words. Although they sound the same when spoken and look similar when written, they can mean very different things. Take the following example, “I went in to ask for directions.” In this sentence, see if “in to” can be replaced with “in order to” and if the sentence still makes sense and means the same thing. After replacement, the sentence “I went in order to ask for directions” still makes sense.  She turned the book in to the library.  The crowd refused to return their unused tickets in to the front office after the show.  The family refused to give in to the captors’ ransom demands. In these sentences, "in" is often a part of a phrase, like "turn in" or "give in". "To", on the other hand, is closely attached to the phrases behind it.  The bug crawled into the sandwich bag.  The boat was driven into the dry dock at low speed.  The athlete threw his tennis racket into the crowd. ---The car was headed into the garage. ---The student placed the book into the locker. He is already at work in his office. ---He is already parked and heading into his office building.